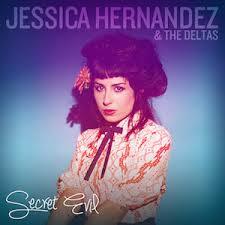 In her dynamite full-length debut, the muscular cabaret-rock of Detroit-born Hernandez leaps, creeps and sweeps. Stoked in ferocious vocals and cool grooves, lip-smacking attractions tease, squeeze, taunt and flaunt in crackling jazz-pop chops as, “Secret,” opts for total disclosure, baring old souls while wearing tarnished hearts on beaded sleeves. Breathing life into fearless fan-dancer tantrums and velvet-lined lounge-lizard misery with exceptional verve and fantastic sass, the rootin’ tootin’ straight-shooting Hernandez is salty and sultry, bruising and soothing, as her band-mates lay down toxic cocktails of brazen buckboard boogie, fiery torch-song blues and unbridled juke-joint jive. The gloriously gutsy Jessica and her high-stepping Deltas play Madison’s Live on King Street along with opener The Weeks and headliner Deer Tick in a rambunctious free show August 22nd.